"William Cassidy" redirects here. 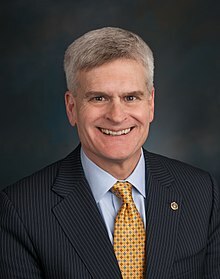 For other persons named William Cassidy or Bill Cassidy, see William Cassidy (disambiguation). William Morgan Cassidy (born September 28, 1957) is an American gastroenterologist and politician who is the senior United States Senator from Louisiana, serving since 2015. A member of the Republican Party, he previously served as a member of the U.S. House of Representatives and the Louisiana State Senate. Born in Highland Park, Illinois, Cassidy is a graduate of Louisiana State University and LSU School of Medicine. In 2006, he was elected a member of the Louisiana State Senate for the 16th district, which included parts of Baton Rouge. In 2008, he was elected to the U.S. House of Representatives, defeating Democratic incumbent Don Cazayoux. In 2014, Cassidy defeated Democratic incumbent Mary Landrieu to represent Louisiana in the U.S. Senate, becoming the first Republican to hold the seat since Reconstruction. William Morgan Cassidy was born in Highland Park, Illinois, one of four sons of Elizabeth and James F. Cassidy, and is of Irish and Welsh descent. He grew up in Baton Rouge and received a B.S. (1979) from Louisiana State University and an M.D. from LSU School of Medicine (1983). Cassidy specialized in the treatment of diseases of the liver at the Earl K. Long Medical Center (LSUMC). His wife, Laura (née Layden), is also a physician; they met during their respective residencies in Los Angeles and married on September 29, 1989. In the early 1990s, both worked at the Earl K. Long Medical Center, where Laura was the hospital's head of surgery. Cassidy worked as a gastroenterologist at the facility until it closed in 2013. The couple has three children. They are members of The Chapel on the Campus, a nondenominational Christian Church that meets on LSU's campus in Baton Rouge. In 1998, Cassidy helped found the Greater Baton Rouge Community Clinic to provide uninsured residents of the greater Baton Rouge area with access to free health care. The Clinic provides low-income families with free dental, medical, mental health and vision care through a "virtual" approach that partners needy patients with doctors who provide care free of charge. Cassidy has also been involved in setting up the nonprofit Health Centers in Schools, which vaccinates children in the East Baton Rouge Parish School System against Hepatitis B and flu. In the wake of Hurricane Katrina, Cassidy led a group of health care volunteers to convert an abandoned K-Mart building into an emergency health care facility, providing basic health care to victims of the hurricane. Cassidy was first elected to the Louisiana State Senate in 2006 as a Republican. He had previously been a Democrat, supporting Michael Dukakis for president in 1988 and donating to the 1992 presidential campaign of Senator Paul Tsongas (D-MA) and to Louisiana Democrats Governor Kathleen Blanco in 2003−04 and Senator Mary Landrieu in 2002. In 2013, Cassidy called his donation to Landrieu a "youthful indiscretion," saying that she "got elected and fell into partisan politics... Louisiana hasn't left Mary, Mary has left us." Since 2001, he has mostly contributed to Republican candidates, including Senator David Vitter. According to Cassidy, he switched parties after the extinction of conservative Democrats and because of his frustration with the bureaucracy and inefficiency of the public hospital system. On December 9, 2006, Cassidy won a special election for the District 16 seat in the Louisiana Senate. In his first bid for public office, Cassidy defeated veteran State Representative William Daniel, a fellow Republican, and Libertarian candidate S.B. Zaitoon. The election was held to replace Jay Dardenne, who vacated the seat he had held since 1992 upon his election as Louisiana Secretary of State. Cassidy was sworn in on December 20, 2006. On October 20, 2007, Cassidy was reelected, to a full four-year term in the Louisiana State Senate. Cassidy received 76% of the vote against Republican Troy "Rocco" Moreau (15%) and Libertarian Richard Fontanesi (9%). On November 4, 2008, Cassidy was elected to serve Louisiana's 6th district in the U.S. House of Representatives, defeating incumbent Democratic Congressman Don Cazayoux with 48% of the vote. He likely owed his victory to the independent candidacy of state representative Michael L. Jackson. Jackson, who is African-American, finished third with 36,100 votes, more than the 25,000-vote margin separating Cassidy and Cazayoux. In the 2010 midterm elections, Cassidy easily won a second term, defeating Democrat Merritt E. McDonald of Baton Rouge with 66% of the vote. In the 2012 election, Cassidy was reelected again, defeating Rufus Holt Craig, Jr., a Libertarian, and Richard Torregano, an Independent. Cassidy received 79% of the vote. In May 2009, Cassidy partnered with California Representative Jackie Speier to introduce legislation that would amend the House of Representatives rules to require that members of Congress list their earmark requests on their Congressional websites. Previous earmark reform efforts had focused on disclosure of earmarks that were funded by Congress. In June 2010, he introduced the Gulf Coast Jobs Preservation Act to terminate the moratorium on deep water drilling and require the Secretary of the Interior to ensure the safety of deep water drilling operations. He worked to ensure that money from the Gulf Coast Restoration Trust Fund, which was established in the wake of the BP oil spill, is spent on coastal restoration efforts. In December 2010, Cassidy voted to extend the tax cuts enacted during the administration of President George W. Bush. He voted for the Constitutional Balanced Budget Amendment of 2011. In May 2013, Cassidy introduced the Energy Consumers Relief Act of 2013 (H.R. 1582) to require the Environmental Protection Agency (EPA) to submit reports to both the United States Congress and the United States Department of Energy regarding proposed regulation that would have significant compliance costs (an impact of over $1 billion). The Department of Energy and Congress would then have the option of stopping or altering the EPA proposal. In 2013, due to the American Medical Association's decision to officially recognize obesity as a disease, Senators and Representatives, including Cassidy, helped introduce legislation to lower health care costs and prevent chronic diseases by addressing America's growing obesity crisis. Cassidy said the Treat and Reduce Obesity Act could help empower physicians to use all methods and means to fight the condition. In June 2013, Cassidy supported a House-passed bill that federally banned abortions after 20 weeks of pregnancy. Also in 2013, Cassidy circulated a draft letter opposing an immigration reform bill, asking for signatures. Representative Mark Takano, a high school literature teacher for 23 years, marked it up in red pen like a school assignment and gave it an F, with comments like, "exaggeration -- avoid hyperbole," and "contradicts earlier statement." In 2014 Cassidy co-sponsored an amendment to the Homeowner Flood Insurance Affordability Act in 2014 to limit annual premium increases for flood insurance, reinstate the flood insurance program's grandfathering provision, and eliminate a provision that required an increase to actuarial levels when a home is sold. Cassidy was a vocal opponent of the Patient Protection and Affordable Care Act (commonly called Obamacare or the Affordable Care Act), arguing that it would fail to lower costs and give too much decision-making authority to the federal government. In September 2014, the House passed the Employee Health Care Protection Act of 2013 (H.R. 3522; 113th Congress), sponsored by Cassidy, enabling Americans to keep health insurance policies that do not meet all of the Affordable Care Act's requirements. In March 2017, Cassidy sent a letter to one of his constituents that falsely asserted that Obamacare "allows a presidentially handpicked 'Health Choices Commissioner' to determine what coverage and treatments are available to you." While in the House of Representatives, Cassidy was a member of many congressional caucuses, including the House Tea Party Caucus and Republican Study Committee. On May 8, 2017, Cassidy appeared on Jimmy Kimmel Live! to discuss health care in the United States. He said that any legislation that he would support must meet the "Jimmy Kimmel test", namely: "Would a child born with congenital heart disease be able to get everything he or she would need in that first year of life?" Kimmel had earlier chastised Republicans for voting to repeal the Affordable Care Act and replace it with legislation that would not ensure protection for children such as his newborn, who was born with a heart defect that required immediate surgery. In September 2017, Cassidy and Lindsey Graham introduced legislation to repeal and replace the Affordable Care Act. The "Graham-Cassidy" bill would eliminate the ACA's marketplace subsidies, repeal the ACA's Medicaid expansion, and introduce a temporary block grant that would expire in 2026. The legislation would also impose a per-enrollee cap on Medicaid funding. The Kaiser Family Foundation noted that the legislation "would fundamentally alter the current federal approach to financing health coverage for more than 80 million people who have coverage through the ACA (Medicaid expansion or marketplace) or through the traditional Medicaid program." An analysis by the Center for Budget and Policy Priorities found that the legislation "would cut federal health care funding by $299 billion relative to current law" in the year 2027 alone and estimated that it would leave 32 million more Americans without health insurance. President Donald Trump endorsed the bill. The bill does not meet the "Jimmy Kimmel test", as it would allow states to eliminate requirements to cover children with conditions like that of Kimmel's child. Kimmel condemned Cassidy, calling him a liar, listed the health organizations that opposed Graham-Cassidy, and urged his viewers to contact their Congressional representatives about the legislation. Cassidy responded to Kimmel, saying that Kimmel "doesn't understand" the legislation. Cassidy also said that under Graham-Cassidy, "more people will have coverage" than under the Affordable Care Act. According to the Washington Post fact checker, Cassidy "provided little evidence to support his claim of more coverage... the consensus [among health care analysts] is that his funding formula makes his claim all but impossible to achieve." Cassidy has an "A+" rating from the National Rifle Association (NRA) for his consistent support of pro-gun legislation. The NRA endorsed Cassidy in his 2014 Senate run and has donated $2,861,047 to Cassidy's political efforts. He also supports allowing veterans to register unlicensed guns acquired abroad. Cassidy opposes gun control on the grounds that it will not stop mass shootings or decrease gun crime. ^ "bill cassidy". Freepages.genealogy.rootsweb.ancestry.com. Retrieved August 18, 2014. ^ "CASSIDY, Bill profile at". Biographical Directory of the United States Congress. Retrieved March 28, 2014. ^ Murphy, Paul (December 5, 2014). "Bill Cassidy's employment at LSU scrutinized". WWL. Retrieved April 6, 2016. ^ M.D, Bill Cassidy (September 29, 2017). "Today, my wife & I celebrate our 28th wedding anniversary. She's my best friend & most trusted advisor. I am blessed to share life with her.pic.twitter.com/zTNQj73Zcv". @billcassidy. Retrieved January 15, 2019. ^ James F. Cassidy obituary, Baton Rouge Morning Advocate, February 24, 2009. ^ O'Donoghue, Julia (January 22, 2015). "Bill Cassidy's most trusted political adviser is his wife, Laura". The Times-Picayune. Retrieved April 6, 2016. ^ Anderson, Laurie Smith. "Program offers health care for adults without insurance." Baton Rouge Morning Advocate, May 24, 2002, Metro Edition, p. 1C. ^ "Congressman Cassidy Celebrates $500,000 Federal Grant With Ribbon Cutting at Westdale Middle School's Health Center". East Baton Rouge Parish School System. October 26, 2012. Archived from the original on January 18, 2013. Retrieved July 14, 2014. ^ "Viral Hepatitis – The Secret Epidemic". US Government Printing Office. June 17, 2010. Retrieved July 14, 2014. ^ Ruggeri, Amanda (November 4, 2008). "Democratic Trends Don't Help Incumbent in Unusual Three-Way House Race in Louisiana". US News & World Report. Retrieved January 5, 2015. ^ Ginger Gibson (November 3, 2013). "Bill Cassidy tries to unite Louisiana conservatives". Retrieved January 5, 2015. ^ a b Ginger Gibson. "Cassidy once donated to his rival". Archived from the original on May 31, 2014. Retrieved May 31, 2014. ^ Cameron Joseph (September 19, 2013). "Cassidy donated to Landrieu's first reelection". Retrieved May 31, 2014. ^ "Louisiana". 2008 Election Results. New York Times. Retrieved September 15, 2014. ^ "Louisiana 6th District Profile". Election 2010. New York Times. Retrieved September 15, 2014. ^ Chatelain, Kim (November 6, 2012). "U.S. Rep. Bill Cassidy cruises to re-election". The Times-Picayune. Retrieved September 15, 2014. ^ "Earmarks should require an itemized receipt". Huffington Post. July 16, 2009. Retrieved April 29, 2014. ^ "H.R. 5519 (111th)". GovTrack.us. Retrieved September 17, 2013. ^ Restuccia, Andrew (August 19, 2010). "In Louisiana, Candidates Fight For – And Over – Oil Jobs". The Washington Independent. Archived from the original on May 2, 2014. Retrieved April 29, 2014. ^ Blum, Jordan (August 23, 2013). "Congressmen spar over BP money". The Advocate. Archived from the original on October 23, 2014. Retrieved April 29, 2014. ^ "To extend Bush tax cuts". The U.S. Congress Votes Database. Retrieved September 16, 2013. ^ "Balanced Budget Amendment". The U.S. Congress Votes Database. Retrieved September 16, 2013. ^ a b "CBO – 1582". United States Congres. Retrieved July 25, 2013. ^ Kasperowicz, Pete (July 24, 2013). "Energy bills advance with House vote". The Hill. Retrieved July 26, 2013. ^ Gross, Charles (June 19, 2013). "Senators Carper, Murkowski, Representatives Cassidy, Kind Introduce Bill to Help Reduce Obesity". Benzinga. Retrieved July 16, 2013. ^ "Abortion becomes issue in Louisiana Senate race". POLITICO. Retrieved October 10, 2014. ^ Alpert, Bruce (March 12, 2014). "Will flood insurance bill get a vote this week?". The Times-Picayune. Retrieved April 29, 2014. ^ Blum, Jordan (May 17, 2013). "Cassidy blasts Obamacare". The Advocate. Archived from the original on May 2, 2014. Retrieved April 29, 2014. ^ Marcos, Cristina (September 11, 2014). "House ok's Cassidy's 'keep your plan' bill". The Hill. ^ Ornstein, Charles (March 22, 2017). "We Fact-Checked Lawmakers' Letters to Constituents on Health Care". ProPublica. Retrieved March 22, 2017. ^ "CBO – H.R. 4899" (PDF). Congressional Budget Office. Retrieved June 26, 2014. ^ Marcos, Cristina (June 26, 2014). "House passes bill to increase offshore energy projects". The Hill. Retrieved June 26, 2014. ^ Graeber, Daniel J. (June 27, 2014). "House measure on gas aimed at lower prices". UPI. Retrieved January 5, 2015. ^ Alpert, Bruce (June 26, 2014). "House passes bill to expand production and drop cap on sharing". The Times-Picayune. Retrieved June 27, 2014. 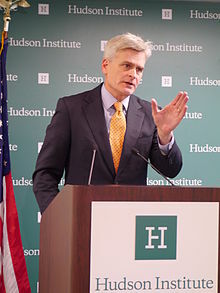 ^ "Committee Assignments | Congressman Bill Cassidy". Cassidy.house.gov. Archived from the original on August 15, 2014. Retrieved August 18, 2014. ^ "Caucus Memberships | Congressman Bill Cassidy". Cassidy.house.gov. Archived from the original on August 15, 2014. Retrieved August 18, 2014. ^ Philip Bump (December 7, 2014). "Mary Landrieu's seat will be held by a Republican for the first time in 132 years". Washington Post. ^ a b c d e "Jimmy Kimmel gets heated about health-care bill, says Sen. Bill Cassidy 'lied right to my face'". Washington Post. Retrieved September 20, 2017. ^ a b c Rachel Garfield, Larry Levit, Robin Rudowitz & Gary Claxton, State-by-State Estimates of Changes in Federal Spending on Health Care Under the Graham-Cassidy Bill, Kaiser Family Foundation (September 21, 2017). ^ Edwin Parks & Matt Broaddus, Cassidy-Graham Plan’s Damaging Cuts to Health Care Funding Would Grow Dramatically in 2027, Center for Budget and Policy Priorities (revised September 20, 2017). ^ Lauren Fox, The one major reason Graham-Cassidy could pass, CNN (September 21, 2017). ^ a b Kessler, Glenn (September 21, 2017). "Analysis | Sen. Cassidy's rebuttal to Jimmy Kimmel: 'More people will have coverage'". Washington Post. ISSN 0190-8286. Retrieved September 21, 2017. ^ "NRA Endorses Bill Cassidy for U.S. Senate in Louisiana". NRA-PVF. National Rifle Association. Retrieved October 4, 2017. ^ Leonhardt, David; Philbrick, Ian Prasad; Thompson, Stuart A. (October 4, 2017). "The Congress Members Receiving the Most N.R.A. Funding". The New York Times. Retrieved October 4, 2017. ^ "Bill Cassidy on Gun Control". www.ontheissues.org. Retrieved January 24, 2019. ^ Whitesides, John (2017). "Justice Kennedy on hot seat in major voting rights case". Reuters. Retrieved October 4, 2017. This page was last edited on 6 February 2019, at 08:47 (UTC).